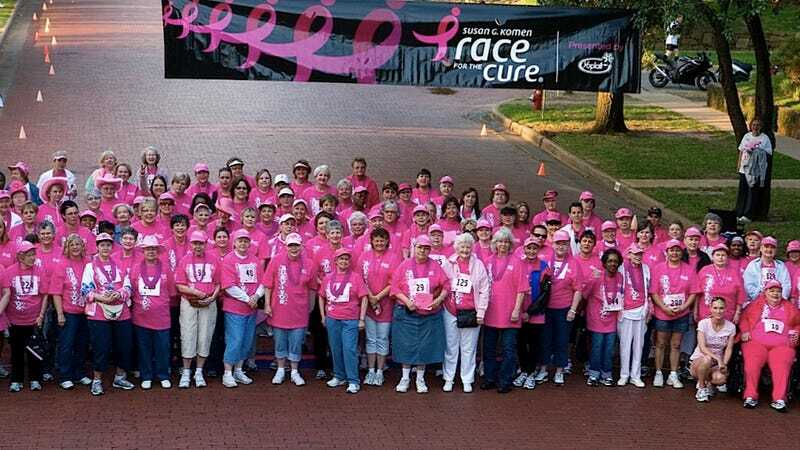 Things are going predictably poorly for the Susan G. Komen Foundation, which, according to the Cleveland Plain Dealer, saw about 2,000 fewer participants in this year's Susan G. Komen Northeast Ohio Race for the Cure than last year's pre-controversy version. The organization had guessed that, ever since it decided to pull funding for breast cancer screenings at Planned Parenthood, fewer people would show up to race for the cure, and on that score Komen has proved extremely prescient — turnout for Saturday's event in northeast Ohio was only about 10,000, way down from a peak of 21,000 in 2006. Though Sophie Sureau, executive director of the Northeast Ohio affiliate, blamed the economic torpor for the low turnout (numbers had started declining in 2008 and 2009), she admitted that "the controversy didn't help." Sureau said that Komen chapters elsewhere in the country have all experienced about a 20 percent drop in race participation (the Ohio race was down by about 15 percent), because people figure they probably have better things to do on a Saturday afternoon than help a hypocritical organization keep its head above water.